Have you always wanted to host your own podcast but have no idea where to start? My name is Rachel Corbett and I've got over 16 years experience presenting radio, television and podcasts. I've created shows for Australia's largest media organisations, have three (and counting) of my own podcasts and teach people how to build their own show from scratch via my online course, PodSchool.com.au. My guide is designed to take the mystery out of the podcasting process and get you on your way! Enter your details below and the internet elves will send a copy of my guide straight to your inbox. 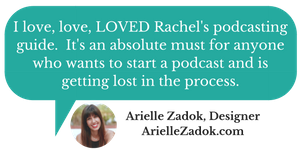 I'd like to receive Rachel's tips for podcast beginners. © Copyright 2019 Rachel Corbett. All rights reserved.